Not a fan of surgery, but want a younger look? 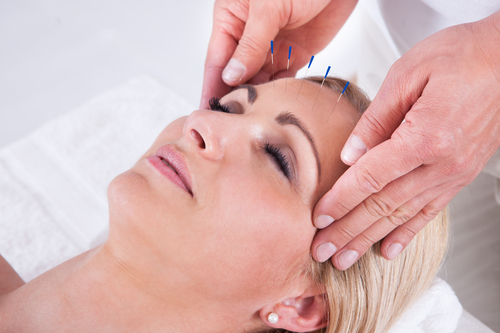 Facial Rejuvination Acupuncture (FRA) is a non-surgical alternative to reducing the signs and symptoms of aging. It is sometimes referred to as an ‘acupuncture facelift’ or ‘cosmetic acupuncture’, but it is much more than that: It slows the aging process from within. FRA is based on the principles of Traditional Chinese Medicine, where hair-thin needles are used to stimulate Qi (pronounced ‘chee’) energy that runs through Meridian channels throughout the body. Comparatively to Modern Western medicine, this can be loosely thought of as blood. There are specific areas on the face, ears, scalp, neck, trunk, arms and legs where this energy can be stimulated for the desired effects specific to the person. Also, many of these meridians begin or end in the face or have deeper channels in the face. Like regular acupuncture, it benefits general health and well-being. This includes benefits such as increased energy, stress reduction, hormonal balance, metabolism, increased quality of sleep etc. Imbalance in any of these areas affect how we age and how we look; so by treating the whole person there are longer lasting, more substantial benefits than just a ‘cosmetic procedure’. The goal is to look AND feel younger! Benefits of a series of FRA treatment include but are not limited to: increased collagen production (via ‘micro-trauma’ of the needle), eliminates fine lines and has diminishing effect of larger wrinkles, increased facial circulation and facial colouring, increases muscle tone, decreases the tendency toward sagging, jowls, and double chins, eliminates and reduces bags under the eyes and brightens eyes, reduces puffiness, lifts eyelids, reduces stress evident in the face, and brings out a person’s innate beauty and radiance. Every person is different, and thus every case will have varying results. Generally, after a full series of 10-15 treatments, one can expect to look at least 5 years younger. An initial intake visit (75-90 minutes) is scheduled to go over contraindications to treatment, review your health history, factors contributing to skin health, assessment of complexion and concerns, TCM assessment, overview of treatment plan and goals, any indicated supplement or nutrition recommendations, and an introductory treatment. Sessions should be scheduled once to twice a week with at least one day between treatments. Maintenance FRA is usually recommended once a month to maintain results. Each regular FRA session is 60-75 minutes long, and includes a uniquely tailored acupuncture session, with acupressure and brief facial massage. Don’t let your health benefits go to waste! Contact Lisa today for your first visit.